On June 2, 1987, Norma and Jeff Hensdill picked up their daughter Tammy Daniel outside the El Cid Club in Beckley, WV at around 3:00 am. They drove her to her home in Stanaford, WV and dropped her off after trying to talk her into staying the night with them. She refused the offer and as they pulled up to her trailer it was obvious that Tammy’s husband Ronald Gene Daniel had already gone to bed. All was dark and the door was locked. Norma asked if she wanted them to go knock on the windows to try and wake Gene up, but Tammy only told them that they “better not”. I’m going to stop there for a moment and give a little backstory. In the months prior to Tammy’s disappearance she’d been photographed with blacked eyes and had to undergo a splenectomy to remove a damaged spleen. So, I’m going to go out on a limb and say that Gene may have been violent toward his wife. Tammy with a mysteriously blacked eye. I haven’t been able to locate any records of police reports about domestic violence, but I know often spouses don’t report it out of fear or embarrassment. I also didn’t see anything that lead me to believe that Tammy was a violent person, so I really don’t think her black eye was the result of a bar fight or something of that nature. As Tammy stared at the dark windows of her home she told her parents that she would just sleep in a tent in the front yard so she wouldn’t wake Gene. Jeff and Norma reluctantly agreed and began to drive away. That’s when Norma asked her husband to stop the car, there was no way she would be able to sleep that night knowing that her daughter was sleeping outside in a tent. Jeff obliged and Norma got out of the car and walked back down the road toward Tammy’s home. As she was walking she heard something like a storm door closing. Once she got to the trailer she checked around both sides and didn’t see Tammy anywhere, so she assumed Gene had woken up and let her inside. She walked back to the car and they went home. The next day Norma and Jeff returned to Tammy’s home only to find out that she was gone. Gene said that he had told her to leave and he didn’t know where she’d gone. After four days with no word from their daughter, the Hensdills filed a missing persons report on her. 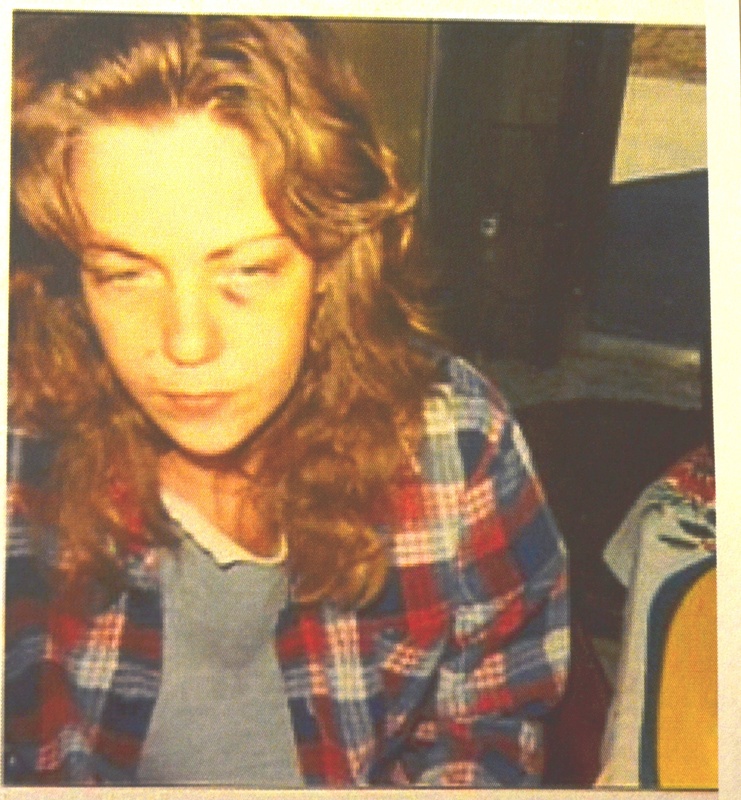 As detectives were beginning their investigation into Tammy’s disappearance a neighbor of the Daniel’s provided them with some information that garnered them a right to a search warrant. Apparently, after Tammy vanished Gene had approached their neighbors and asked to use their vacuum cleaner. When he returned it, it smelled terrible and was filled with a sticky substance. Consequently the vacuum was tested for blood on three separate occasions and on each one it tested positive. It was actually the very same blood type of Tammy. Whenever the Daniel’s residence was being searched police located some stains in the bedroom that appeared to be blood. It went through the carpet and into the padding. Gene could offer no explanation about how it had gotten there either. Gene was actually indicted for Tammy’s murder, but without the body the case was dismissed for lack of evidence. Tammy’s social security number hasn’t been used since the last time her parents saw her. Fast forward a bit now to January of 1989, Gene was actually convicted in the 1988 shooting death of Walter Morgan. If you want to read more about that occurrence, the court documents are here . In 2007 a report by the local news brought in a tip which lead investigators to search some property in the Sand Lick area of Raleigh County, WV but it was unsuccessful. All in all, I think it’s quite upsetting that there hasn’t been any charges in her case. In my humble opinion, it’s completely obvious what happened to Tammy on the night she went home. 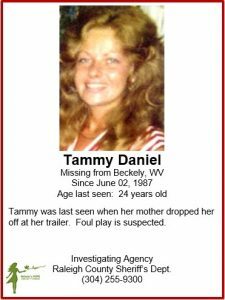 Authorities are still investigating, still looking for Tammy’s body. Please contact the Raleigh County Sheriff’s Office if you think you have any information regarding the location of Tammy’s body at 304-255-9300.